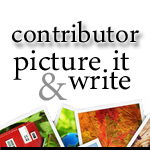 This is my entry into the Picture it and Write creative writing challenge hosted by the authors of Ermiliablog. Tammy was really excited about showing her friends the house. She’d found it when exploring the village. She knew Mummy said she shouldn’t ever go past the big wall but the crumbling stones and low hanging branches had given her the perfect place to clamber over. It was easy – though she really hoped Mum didn’t notice that rip in her new jeans… The house was empty. Not just ‘out at the shops’, empty but no furniture or anything. It was amazing. She’d told Lily and Jacob about the place and they, of course, wanted to see it too. She’d told them how the corridors were so long and wide they could run races in them; how the rooms echoed when she shouted rude words. She’d told them it might be haunted. That was why they were visiting as the sun set, creeping in through the open doorway and jumping at every shadow. 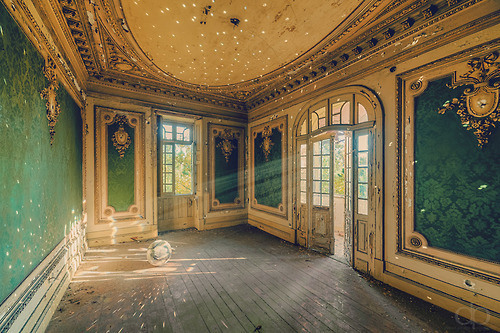 She wouldn’t tell them how the place looked early in the morning, as the sun bounced off the abandoned disco ball. At those times she could dance among the sunbeams and pretend she was surrounded by fairies. That would be her secret. Lovely story – I love the ending! Thank you. 🙂 I figured a tom-girl like Tammy wouldn’t want her friends to share her dancing with fairies! Sorry, Tammy, but Mummy is going to notice the rip in your new jeans. I’m glad you like it! Mummys always do notice, don’t they? So sweet and lovely. Haha I love this line “how the rooms echoed when she shouted rude words.” Great contribution! Just tasty, and i love the “secret” ending. Got to have something that was her’s alone. After all, she found it. Nice done. Beautifully penned… Oh, those joyous moments… I wish I was a kid again! Thank you! I’m glad you like it. 🙂 Childhood is a time for creating beautiful memories.